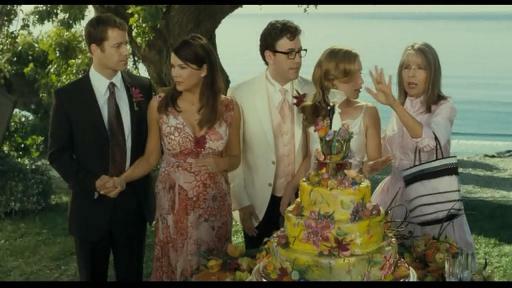 Jane Nichols (Katherine Heigl): 27 Dresses. I loved her dress, the yellows, and the beach – and the 27 bridesmaids in the most ridiculous outfits ever. At the one that counted … not the huge Vivienne Westwood, bird on her head hoopla – just her vintage suit, Something Blue Manolos, and Big. 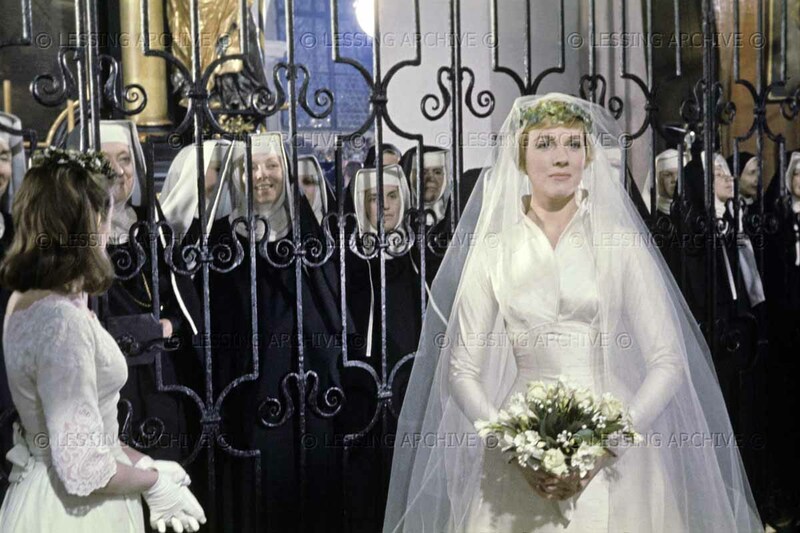 Oh Fraulein – if the nuns could see you now (Oh they can – through the gate!) marrying a Captain and gaining a singing children’s troupe all in one day! Sweet, young Annie getting married wearing her basketball sneakers under her dress. 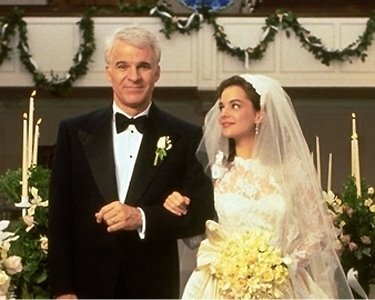 Despite all her Dad’s anxieties over money and the fact she was growing up, Kay made it down the aisle to marry her Buckley. 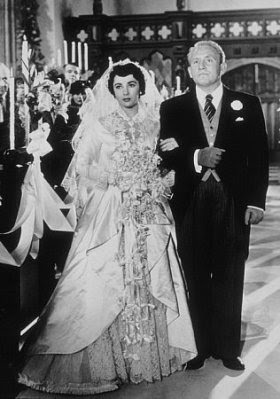 It was also good practice for Elizabeth Taylor, who after making this film would walk down the aisle eight times in real life. 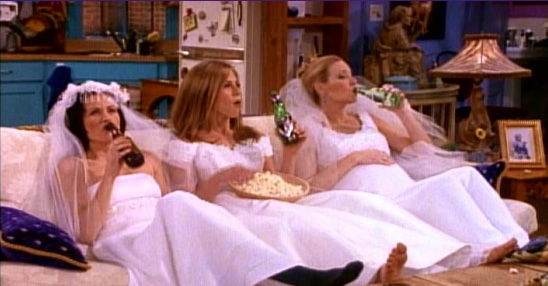 This was one of the funniest episodes episode – eating popcorn and drinking sodas while sitting around in wedding gowns. 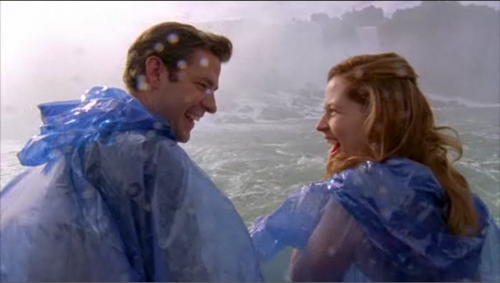 Jim and Pam finally make it to their wedding day, but they escape the craziness and elope at Niagra Falls instead – only to return to the church to do the big ceremony for everyone else. Doesn’t every bride dream of doing this? Finally after six years and numerous obstacles (other men -Julian, other women -Lindsay, psycho stalkers, basketball championships, etc etc ) Lucas and Peyton finally said “I do” with Brooke as Maid of Honor, Haley as the officiator and a baby on board. 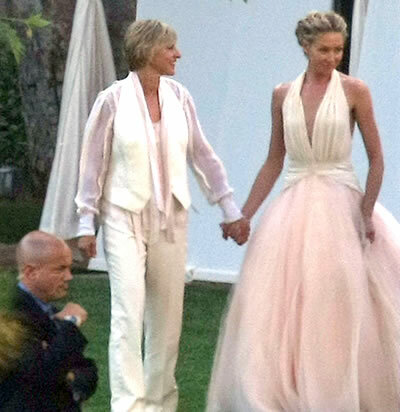 Ellen DeGeneres and Portia de Rossi – They share my exact wedding anniversary – 08/16/2008 – Happy four years Ellen and Portia! 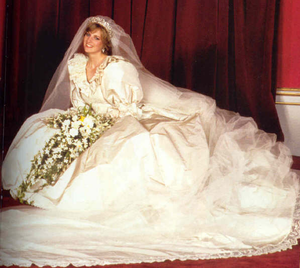 and of course, my #1, Princess Diana… this is my favorite picture. 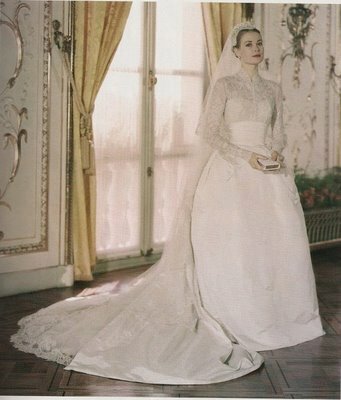 Who are some of your favorite brides? 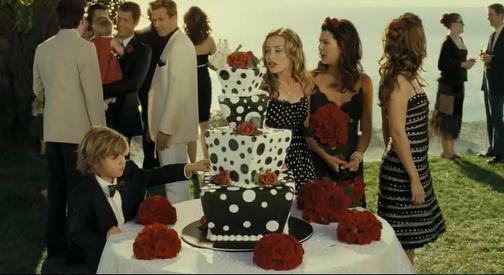 Which dresses are most memorable to you from TV, the movies, or real life? Leave me a comment and let me know! Have a great day!